A common catchphrase from coaches and players is that the traditional August 1 start to the Officiating Seminar season and seminars that run through November conflict with their regular hockey commitments, why can’t we run them sooner? 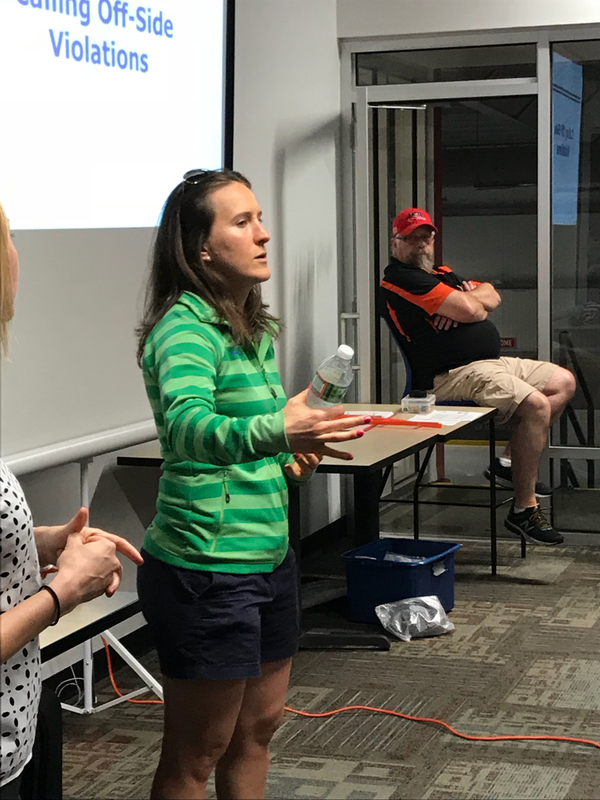 While there are several reasonable reasons why, USA Hockey decided to approve a pilot program that allowed both the Atlantic District and Massachusetts District to run seminars in June, but with a twist and bonus. All officials are required to complete several steps on an annual basis to become “patched” or complete with USA Hockey; Officials must attend a seminar, which includes both classroom and ice time, complete a series of online training modules and pass an open book test. The modules and the open book test are usually completed on the participants own time. USA Hockey’s twist to this pilot was that everyone must be a brand-new official, and all participants would complete all the requirements the same day, effectively allowing them to walk out the door at the end of the day and go officiate games. The bonus to the participants was that they would be registered for the remainder of the 17/18 season and the 18/19 season. Here in Massachusetts we had an overwhelmingly positive response to an aggressive marketing campaign, with over 300 people showing interest in the class, and 216 actually registering for the class. The day started at 7:30 AM with registration and check in, and class commenced shortly after 8:00 AM. In addition to our normal presentation, we also invited several guests to speak to the 196 attendees about the opportunities in officiating. 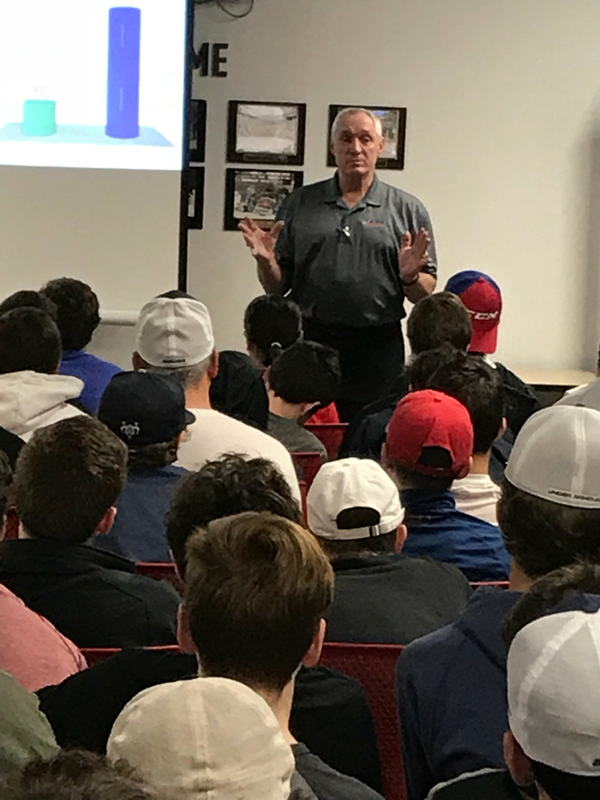 Former NHL Referee and Massachusetts Hockey Hall of Fame Member, Paul Stewart (MA), spoke to the class about some of his experiences and reviewed the opportunities that he has for more experienced officials, including Division 1 men’s and women’s college hockey. 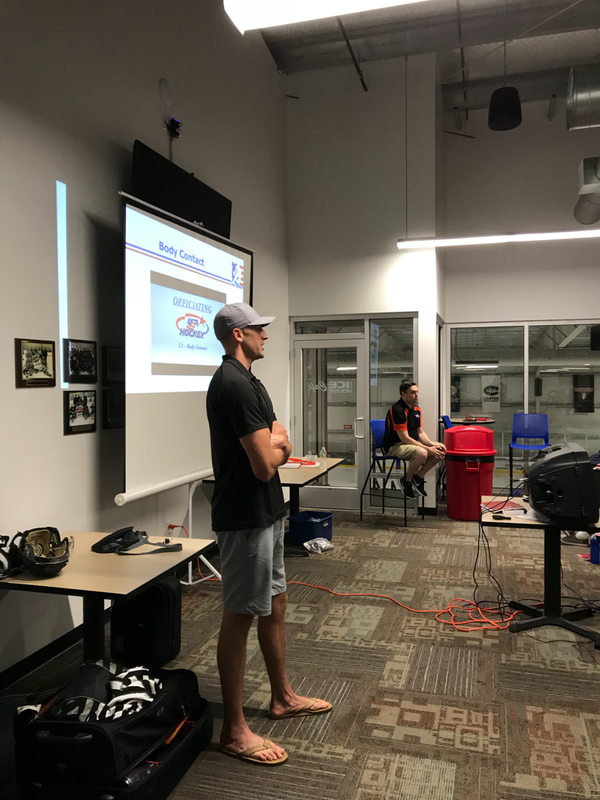 Former AHL Referee Gene Binda Jr (MA) spoke to the class about the USA Hockey path that he followed through the Officials Development Program, the USHL, ECHL and finally the AHL. 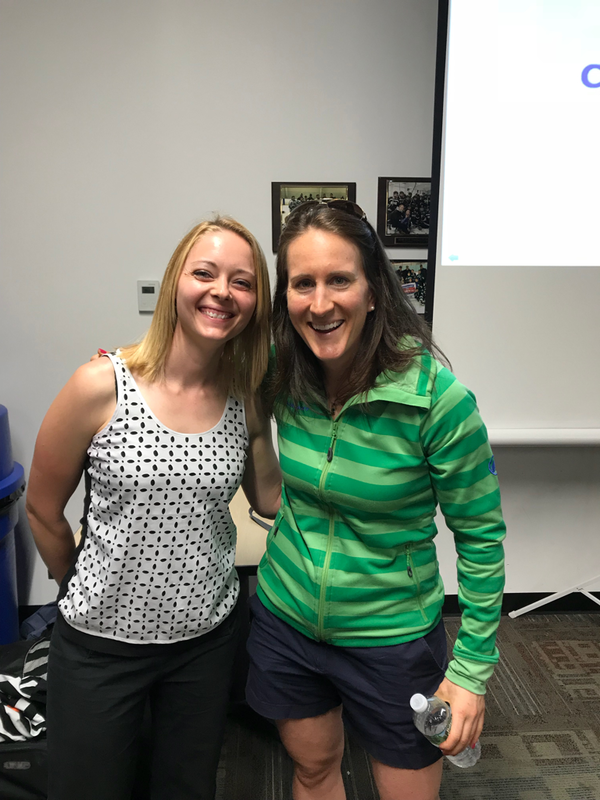 2018 Olympic Referees Katie Guay (MA) and Dina Allen (NY) and IIHF Licensed Jenny Cameron (MA) spoke about the various paths for female officials, and the opportunities that USA Hockey has provided for them to officiate hockey around the world. 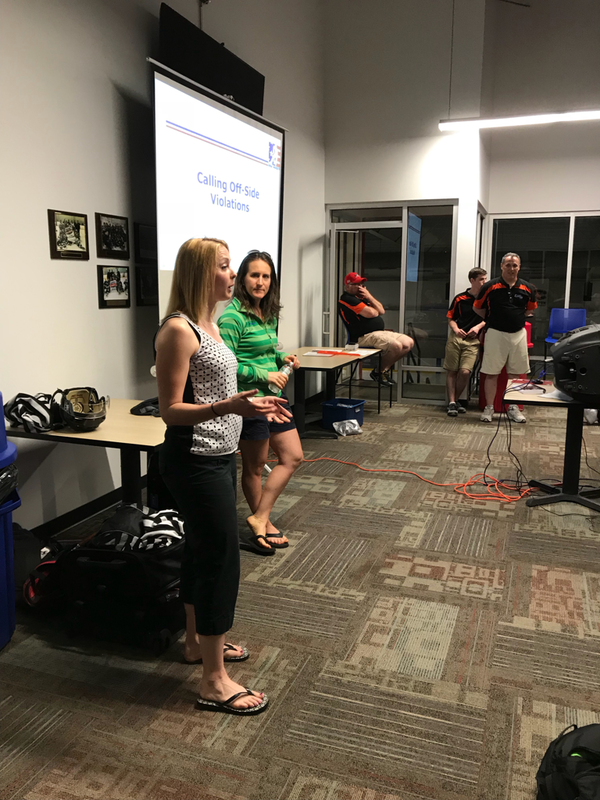 Gene Binda Sr, who assigns across the country, spoke about local and regional opportunities to officiate youth hockey, Junior Hockey and College Hockey. 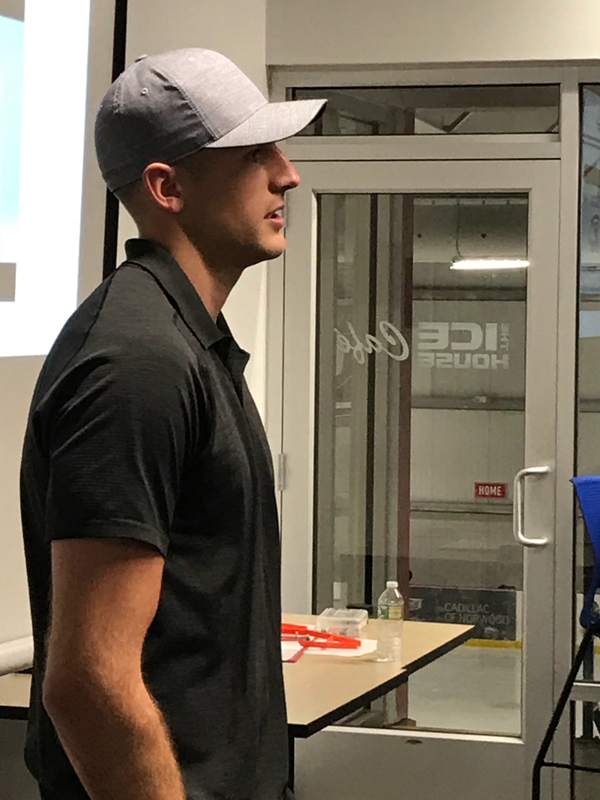 Finally, special guest and current NHL Linesman, Ryan Daisy (MA) recounted his path to the NHL which included taking time off from officiating, a finance degree, the realization that the love of the game drew him back to his purpose, which resulted in working in the Officials Development Program, The USHL, The ECHL, The AHL, and culminating with a full-time position in the NHL. As the day progressed, participants learned about positioning, calling penalties and game management techniques through the presented materials and reinforced with USA Hockey’s video modules including review questions. Later in the day, the participants were split into four groups with two groups headed to the ice to apply the material in a practical yet controlled manner, while the other two groups completed their open book testing. To complete the day, the groups switched so that all participants had the opportunity to practice on ice situations and complete their testing. By the end of the day, USA Hockey gained nearly 300 new officials between the class in Massachusetts and class that ran in the Atlantic District, officials that were complete at the end of the day, and ready to launch their officiating careers. While we do not have plans to offer another one of these “all in one day” seminars again this summer, our regular seminar season starts on August 1st. Visit our website http://massofficials.com or https://www.usahockey.com/officials for more information. Special thanks to the Canton Ice House for their hospitality, and to the Massachusetts Hockey Officials Seminar Staff members that worked tirelessly to make the day a success. Additionally, special thanks to Gene Binda, Jr. and Gene Binda, Sr. for their assistance.